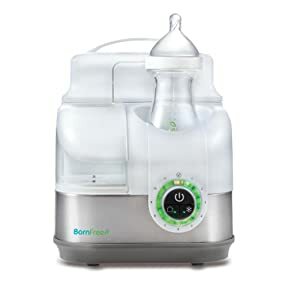 The Born Free Tru-Temp Bottle Warmer + Cooler is designed to make your life as new parents easier, by warming breast milk or formula to the perfect temperature for baby in as fast as three minutes. It comes with an insulated cooler and two ice packs that will keep two bottles cool throughout the night (8 hours), allowing you to keep the bottle warmer in your room or your child’s room, avoiding trips to the kitchen in the middle of the night. You can take a bottle out of the cooler, change your baby’s diaper while the bottle is warming up, and then give your baby a perfectly warmed bottle. 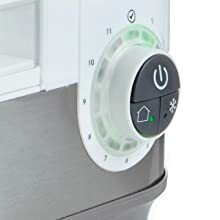 While some bottle warmers require that you fill an exact amount of liquid each time you are warming a bottle, this bottle warmer is much easier. With the Born Free system, you only need to fill the water reservoir once every day or two, and it does all the work for you by automatically using the right amount of water based on the size of bottle and temperature of milk or formula. The Born Free Bottle Warmer is simple to use and requires no calculations or guesswork. Your baby will have a perfectly warmed bottle every time in just three easy steps: Step 1: Check the table on the back to see which setting you need for your bottle size and type. Step 2: Dial your setting. Step 3: Push the button for room temperature or refrigerated. The bottle warmer will automatically calculate the warming time. The green lights will indicate where it is in the warming process and will show a green check-mark when it’s ready for baby. There is an auto-shut-off for added convenience. The insulated cooler and two ice packs will keep two bottles cool for up to eight hours. The convenient feature allows you to keep the bottle warmer in your room or your child’s room, avoiding trips to the kitchen in the middle of the night. 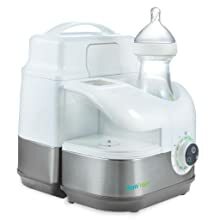 You can take a bottle out of the cooler, change your baby’s diaper while the bottle is warming up, and then give your baby a perfectly warmed bottle. The Born Free Bottle Warming System is fast and convenient to use. It will warm a 5 oz. bottle to the perfect temperature for baby in approximately three minutes, and a 9 oz. bottle only takes four to six minutes. This is a premium bottle warmer with convenient easy-to-use features and modern stainless steel styling to complement your kitchen decor. The Tru-Temp bottle warmer + cooler is designed to safely warm breast milk and formula. You can easily warm a 5oz bottle to the perfect temperature in just three minutes. For nighttime feedings, the removable, insulated cooler feature will keep 2 bottles cool for up to 8 hours before warming. Superior convenience has never been easier. 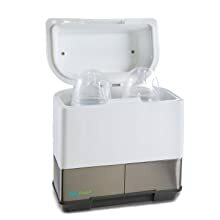 Has a cooler so you can keep it in your room with an extra bottle or two, so you don't have to run to the kitchen when your baby needs another bottle. A little complicated with the dial your bottle size, but I guess it can be helpful.